An Ancient Solar System...: 5 alien landscapes that baffled astronomers, part 1. 5 alien landscapes that baffled astronomers, part 1. 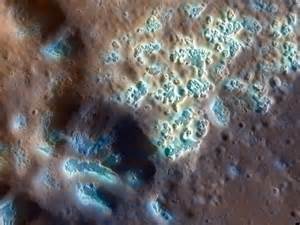 Above: A view of the mysterious planetary mould, with the colours exaggerated to help it stand out. Courtesy of NASA. NASA's MESSENGER space probe to the planet Mercury did a lot of good science. But they didn't expect to see the planet going mouldy. This is not behaviour you'd expect from a planet's rocks - bad Mercury! Above: A map of the ice filled craters, made of data from the Arecibo radio telescope and NASA'S MESSENGER space probe. 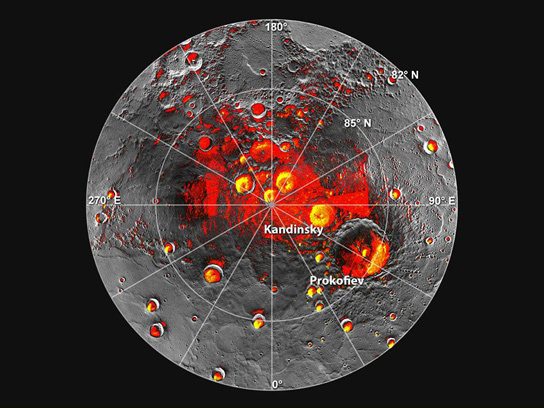 This isn't an image in visible light: It's a radar map of Mercury's north pole, taken using radar signals from the gigantic Arecibo dish on Earth, and data from NASA's MESSENGER probe. The yellow patches are radar reflections from the bottom of certain craters - craters with the same unique property as some of those at the Moon's poles: They are in permanent shadow - the Sun hasn't risen there for billions of years. And, like the moon, it's shadowed craters are full of ice. So there's ice... on a planet where daytime temperatures would melt the solder on a lander's circuit boards. Above: A Lunar swirl. It's... swirly. This bizarre swirly thing is actually etched onto the Lunar surface is called... a Lunar Swirl. Wow. Way to go all out with the originality there people. Exactly what has gone and etched a weird quasi symmetric pattern onto the Lunar rocks wasn't clear for a long time, but now there's a fairly well accepted theory - it's the Sun. These Lunar rocks here have a remnant of the Moon's ancient magnetic field, and it focuses the charged particles of the solar wind in such a way that it bleaches the surface in this strange pattern. Ziiiigggy stardust and the spi- ahem. I'll be quiet. 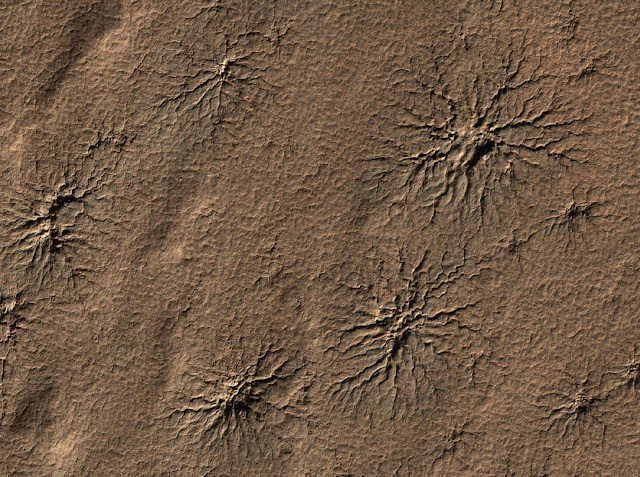 Something has carved bizarre spidery patterns into the Martian surface. Of all the things carved on the surfaces of other planets, these are among the weirdest looking. As cool as it would be (also terrifying), they aren't actually carved by giant Mars spiders. But they were - we think - carved by something equally alien: Natural dry ice, evaporating to carbon dioxide gas, which gets trapped under ice and carves these channels to escape. When the Hubble space telescope turned it's giant eye towards the dwarf planet Ceres astronomers saw right away that there were some bright patches - that's not unusual, asteroid strikes throw up buried brighter rocks all the time. But when the Dawn spacecraft actually arrived, the bright spots turned out to be far too small, and far, far to bright to have any of the origins the'd originally expected. 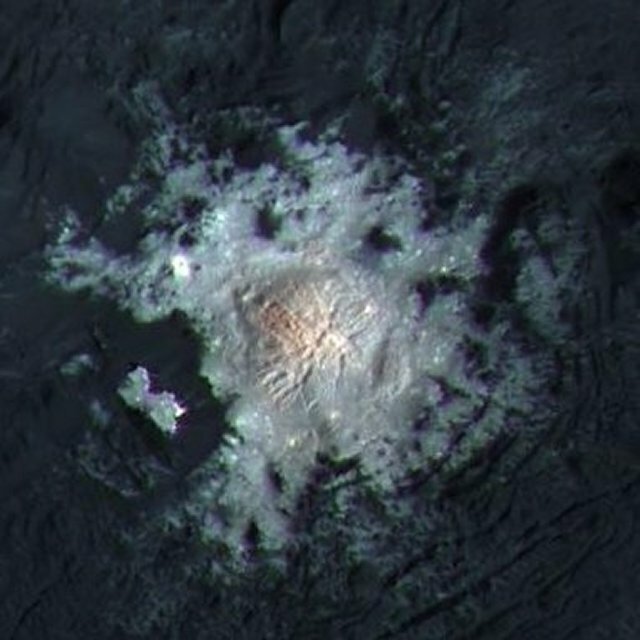 In the end, the Dawn mission has used super-closeup views like this, and its suite of sensors, to find evidence that these are patches of dried up salt - likely evidence that this tiny dwarf world once had a vast ocean beneath its crust.